Louis Zukofsky famously wrote in his poem “A 12,” “I’ll tell you. / About my poetics— / music / speech / An integral / Lower limit speech / Upper limit music.” And this line came back to me over and over again while reading (over and over again) Tongo Eisen-Martin’s second book, Heaven Is All Goodbyes, released by City Lights in September 2017. Something we all strive for, as poets, is to get the most out of language we can; hence both speech and music occurring in one instant, in one language act. 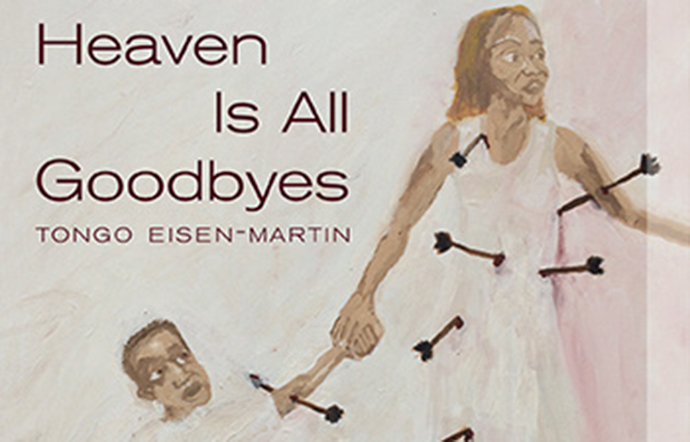 And though more comes in between those limits, Eisen-Martin’s work refuses to choose one limit or one side; it is simultaneously a call to action, a deeply political book which carries with it a reverence for the lyric, resisting categorization as the best poems do. The book takes on and responds to the crumbling system of capitalism, state violence, the prison industrial complex, African diaspora, and those marginalized and oppressed in American culture. Using a cacophony of voices, broken and constantly refigured images and a surreal syntax, the 42 poems in the book create a world that is singing and yelling at you from all corners. The voices of those human speakers, the subjects speaking, facing the violence of the system, are often dismantled or replaced by that violence: “he decided not to kill me like giving loose change” (39), the subject not being killed is done as a casually generous act, an afterthought. The disorienting, powerful book reads like a long poem with central images or tropes floating through the series. One thinks the next time this polyvocal work comes back to an image it would be clearer, or crystalline, but the poems remind us that it is about the movement as well as unpacking the interplayed layers that almost function as trope in a story, and remain resistant to being cohesive enough to be named a narrative. And that seems the point. The constant streaming of what could be scraps of conversations overheard, or a speaker’s fractured thoughts, could as easily also be a talented chorus that sings or summons by every person singing something differently but beautifully and at the same time. Eisen-Martin is able to get an immediacy from language that is indebted in part to the deftly orchestrated arrangement of voices, using both italics and quotation marks that float in and out, but also to the speed at which the language is moving, carrying both the reader, the speaker, and the images so quickly, you are in no way asked to configure some map drawing which voices match—which, jumping from one italic to another, will not unify a narrative. And the emphasis on polyvocality rejects that kind of reading. “I am not an I. If you cannot contribute to the capitalist apparatus, you cannot exist. The poems move at an incredibly rapid pace, and encompass a transitory space more akin to spoken language, with dreamscapes and sense breaking images, which enact the kind of invention and destruction of the individual as both existing because of, and not able to exist in, and destroyed by the current condition. And though these poems are impossible to pin down, so to speak, we are often in very real places: San Francisco, and Gary, Indiana, dealing with very present and real problems, and the poems are even more complicated by their refusal to choose a side in the classic poetic debate of politics vs. aesthetics in that they are not only intrinsically linked, but neither privileged, or rather sacrificed for the other, they are in service to each other, harmonious as the voices that appear singing parallel.